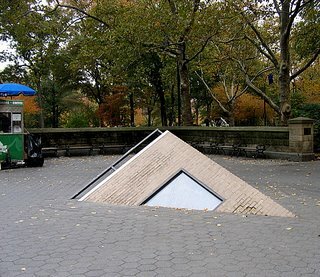 NYC is always full of interesting outdoor art thanks to the Public Art Fund, the leading presenter of artists' projects. For 25 years the PAF has been bringing artworks outside the traditional context of museums and galleries, letting the public encounter the art of our time. This installation was on the southeast corner of Central Park, on 5th avenue. 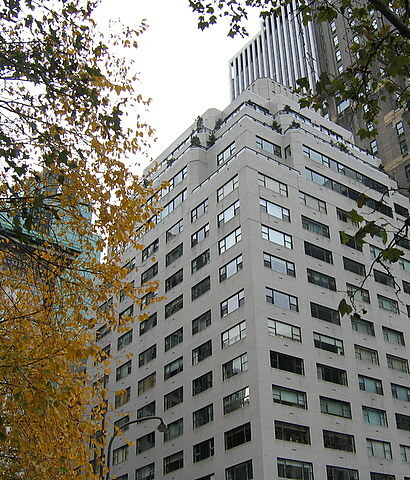 The sculpture resembles the white brick apartment that stands on the opposite corner across 5th avenue. Although it is in pristine condition the structure seems to have sunk in the ground or slowly surfaced like an archeological relict. Through the building's windows, you can see an interior view of everyday objects extending several feet below street level. The artist is Sara Sze. If you're interested, you can view a slide show of the process here. DAMN! I wish I knew about this whie I was in town! Would have been cool to actually look in the window.